Signs of cooperation among communities within particular regions appear at different moments in the archaic and early classical periods. Across regions, however, evidence for an emergent group identity, articulated around descent from a common ancestor and the occupation of a shared territory, tends to precede evidence for active cooperation among communities. While this similarity is highly significant for our understanding of how the koinon developed, divergences in other respects command our attention. The process of urbanization that is a central part of polis development occurred differently in each of the three regions that form the core of this study, and this development appears to be correlated to the emergence of cooperation among communities, accounting at least in part for the distinct developmental trajectories we can trace in each region. We have glimmers of evidence for an active sense of group identity and for conflict as well as cooperation among the early-developing poleis of Boiotia in the archaic period. But in Achaia and Aitolia these are largely developments of the fifth century, during which time the Boiotians develop a sophisticated set of formal state institutions at the regional scale, incorporating established poleis as members of a koinon. Similar institutions appear in Achaia and Aitolia only in the fourth century, although there is much less evidence for these areas, and we can trace the process with considerably less detail than is possible for Boiotia. As a result, each region will be treated separately in the first chapter. It is only in the fourth century, the subject of chapter 2, that the histories of the mainland Greek koina can be integrated into a more coherent narrative. Despite some evidence for an emerging Boiotian identity that comprised the region's many poleis as early as the eighth century (map 2), relations between those poleis were characterized as much by competition as by cooperation. We shall see that both forms of engagement contributed to the development in the classical period of political institutions at the scale not of the single polis but of the region. In the late eighth century a hierarchy of communities seems to have emerged, partially at least through the absorption and subordination of smaller communities. This process is evident in Hesiod's Works and Days, which represents the village (kōmē) of Askra as being in some way subordinate to a larger polis, typically assumed to be Thespiai. All we can learn of the nature of this subordinate relationship from the poem is that judges in the polis had, or claimed, the authority to resolve disputes arising in the village. If the polis alluded to by Hesiod was in fact Thespiai, it is likely that the subordination of Askra was accomplished by coercion rather than cooperation, for both Plutarch and Aristotle report the slaughter of its inhabitants by the Thespians sometime after the death of Hesiod. Whether it was by the absorption of smaller communities or other means, by the early sixth century the Thebans had enough strength to begin making claims to regional leadership. The Shield of Herakles, preserved among the manuscripts of Hesiod, provides good evidence for these claims. The last eight lines of the poem contain an allusion to the so-called First Sacred War, meaning that it must have reached the form in which we know it only after about 590. Although details of the conflict are irretrievably lost and the literary sources for it reflect later traditions, we can still detect its basic contours. The First Sacred War began as a local Phokian conflict over Delphi but escalated to involve several other poleis and ethnē of central Greece. The Thessalian victory in this conflict led to the subjugation of the entire region of Phokis and a significant increase in Thessalian influence in central Greece, which elicited a hostile response from the neighboring Boiotians. This response was highly significant for the emergence of regional political cooperation in Boiotia, and the pseudo-Hesiodic Shield seems to represent a strategy for justifying Theban leadership of that cooperation. In the poem Herakles' slaughter of Kyknos (ll. 370-423), son of Ares and son-in-law of Keyx, the ruler of Trachis (ll. 353-56), is presented as an act of vengeance on behalf of Apollo, for Kyknos had been waylaying Apollo's pilgrims and stealing their hekatombs (479-80). There is a heavy local accent about this poem, in the occasional use of epichoric forms and in the emphasis on place and the origins of both hero and antihero. The sons of mighty gods, Herakles is nevertheless depicted as a Theban hero, and Kyknos as a Thessalian one. The conflict thus boils down to one between a Theban and a Thessalian over the right worship of Apollo, or at least over the manner in which his pilgrims and his sanctuary were treated. The poem also has a defensive tone: the Thessalians have corrupted the cult of Apollo, and the Thebans are its true defenders. In other respects, too, the poet is at pains to show that the gods favor Herakles, Thebes, and Boiotia: Apollo disregards Kyknos's prayer for victory over Herakles (68); and Iolaos reminds Herakles that both Zeus and "bullish Poseidon, who holds the turreted crown of Thebes and defends the city," honor him greatly, a likely allusion to the cult of Poseidon at Onchestos, in central Boiotia. If that is correct, it would suggest that in the early sixth century the Thebans had a proprietary interest in a rural sanctuary that in later periods at least was panregional and that was never, so far as we can tell, in the possession of a particular polis. The poem as a whole reads like a claim, expressed in mythical terms, about the propriety of Boiotian relations with Delphi and the unwelcome aggressiveness of Thessalian interests in the shrine. Indeed the description of the obliteration of Kyknos's tomb by Apollo, a detail in the myth apparently invented by the poet of the Shield, seems to echo the destruction of Krisa in the war. The poem thus makes a powerful and menacing claim: those who mishandle Apollo's sanctuary and his pilgrims will be destroyed by his Theban protectors. Other evidence confirms that hostility between the Thessalians and Boiotians escalated in the early sixth century. Plutarch mentions, in two conflicting accounts, a battle at Keressos in which the Boiotians drove out the Thessalians and thereby "liberated the Greeks." It is impossible to date the battle precisely, but it probably belongs in the early sixth century. Fortifications west of Orchomenos and on the akropolis of Chaironeia have been dated to the sixth century and make good sense as part of a defensive system constructed against the Thessalians, who probably occupied, or at least controlled, Phokis in that period. It is thus possible that a military demonstration of the hostility between Boiotia and Thessaly manifested in the Shield of Herakles did occur in the first half of the sixth century. In this context the suggestion that the Shield may have been composed for the inaugural celebration of the Herakleia or Iolaeia in Thebes to celebrate and commemorate the victory over Thessaly at Keressos is particularly attractive. The Shield articulates in mythic terms the Theban response to the Thessalian presence in central Greece after the First Sacred War. It reflects not only hostility toward Thessaly but also a Theban claim about the city's high status and power within the region. For if the Thessalians were perceived as abusing the cult of Apollo (probably at Delphi), then it was the Thebans who put them in their place, led by the hero Herakles and with the support of Athena, Zeus, Poseidon, and Apollo themselves. That creates a fertile soil indeed for planting claims to regional hegemony in the future. Yet for all the regional cohesion evoked by the Shield, there are reasons to believe that tension, conflict, and unrest were rife. The Boiotians participated in the settlement of Herakleia Pontike on the Black Sea in this period. With the exception of a small contingent at Thourioi, this was the only occasion on which Boiotians participated in overseas settlement, and it may point to local tension and conflict as a motive for the departure of some Boiotians. Ongoing unrest within Boiotia is attested for the second half of the sixth century by a series of arms dedicated as votives at Olympia to commemorate military victories. A bronze helmet of the period circa 550-525 records a victory of Orchomenos either over the Koroneians or from a battle that occurred at Koroneia. A bronze greave from the end of the sixth century records a Theban victory over Hyettos. And two bronze shields hint at fighting involving Tanagra, one recording a Tanagran victory and one recording a victory over Tanagra; neither shield preserves the name of Tanagra's opponent. The greave recording a Theban victory over Hyettos has been cited as evidence of Thebes' expansion to the northwest in the late sixth century, and while that is indubitably true it is also only one piece of the puzzle: we do not know whether the Orchomenians won their victory over Thebes or some other enemy, and we certainly cannot ascertain what was happening at Tanagra in the period. Four bronze plaques recently discovered in Thebes appear to record the settlement of land disputes between Boiotian poleis in the late sixth century; they may eventually shed some light on the conflicts that until now have been recorded for us only by the series of arms dedicated at Olympia. But before we conclude from these hints of interpolis competition that Boiotia was riddled with strife in the second half of the sixth century, we have to account for the appearance circa 525-500 of a series of coins minted in Boiotia on the same standard with similar types, and legends pointing to multiple polis mints. Initially only Thebes, Tanagra, and Hyettos participated-precisely the cities that, along with Orchomenos, were engaged in active conflict in the previous quarter-century. Orchomenos remained aloof from the cooperative minting arrangement of the other Boiotian cities until the fourth century, but Hyettos may have been compelled to join this minting union by the Thebans in the victory they commemorated at Olympia, and the shields dedicated at Olympia from fighting over Tanagra may reflect the struggle that finally brought that city into the minting union. Within a short period, these three monetary partners were joined by Akraiphia, Koroneia, Mykalessos, and Pharai. Until quite recently this numismatic evidence has been interpreted by historians as incontrovertible proof of the existence of a fully functional Boiotian League or koinon. Implicit in that argument is the claim that a coordinated coinage issued by multiple poleis can only have been produced by a fully developed political entity that encompassed them all. However, the assumption that coinage functioned primarily as a symbol of political autonomy is questionable, and it is clear that such coinages, whether produced under voluntary or compulsory conditions, must be understood as economic instruments above all, with their political import a secondary indicium of the coinage itself. That argument is based in part on the underappreciated fact that coinages issued by multiple poleis with common types on a common standard are a widespread phenomenon of the classical Greek world, in no way limited to regions in which we know a koinon later developed. The coinage of late sixth-century Boiotia, then, cannot be taken as evidence for the existence of a koinon. It does, however, provide excellent evidence for economic cooperation among the Boiotian poleis in the same period. The purposes for which the coinage was initially created are unclear, but the usual guess is that coins were produced to meet military needs and state pay, as well as to facilitate exchange in those cases in which small denominations appear early. In chapter 5 I shall discuss in detail the kinds of interpolis, regional economic interactions that may lie behind this innovation, but for now two interesting passages in Herodotos may shed some light on the question and also begin to nuance our understanding of the development of regional cooperation. In 519 the Plataians were being pressed by the Thebans, Herodotos tells us, and sought assistance from a Spartan force led by Kleomenes that happened to be in the area. Kleomenes refused the Plataians' request and referred them to the Athenians, on the grounds that they lived too far away to be helpful but really, Herodotos says (6.108.3), out of a desire to embroil the Athenians in a conflict with the Boiotians. The Plataians went to Athens as suppliants, and when the Thebans learned of this they marched against Plataia. The Athenians went to their assistance, but an engagement was avoided by an eleventh-hour Corinthian arbitration of the dispute by which the borders of Plataia were fixed (with the Asopos River as the basic natural boundary line) and the Thebans were prohibited from pressuring "any of the Boiotians who were not willing to contribute to the Boiotians," es Boiōtous teleein (6.108.5). This puzzling phrase has not attracted much attention; most scholars and translators assume that it means "to join the Boiotian League." That is, however, to assume more about the nature of Boiotian interpolis relationships and regional power structures in the late sixth century than the evidence really permits, and I shall argue later (chap. 5) that it means rather "to make contributions to the Boiotians." For now I take it as certain that the Thebans were pressing the Plataians to contribute to the Boiotians in 519, but that is no indication of a fully fledged federal state in Boiotia in the period. It is, however, an indication that the Thebans were attempting to create some kind of regional power structure, which they were calling "the Boiotians," rather than simply trying, as a polis, to subordinate their neighbors. In the ancient Greece of Pericles and Plato, the polis, or city-state, reigned supreme, but by the time of Alexander, nearly half of the mainland Greek city-states had surrendered part of their autonomy to join the larger political entities called koina. 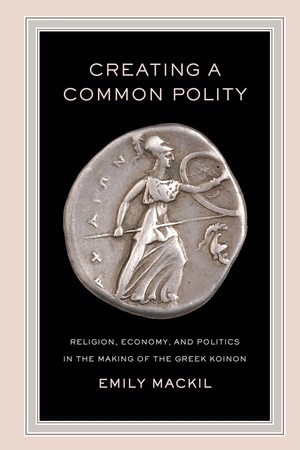 In the first book in fifty years to tackle the rise of these so-called Greek federal states, Emily Mackil charts a complex, fascinating map of how shared religious practices and long-standing economic interactions faciliated political cooperation and the emergence of a new kind of state. Mackil provides a detailed historical narrative spanning five centuries to contextualize her analyses, which focus on the three best-attested areas of mainland Greece—Boiotia, Achaia, and Aitolia. The analysis is supported by a dossier of Greek inscriptions, each text accompanied by an English translation and commentary. Emily Mackil is Associate Professor of History at the University of California, Berkeley. "Well-informed and beautifully written, Creating a Common Polity represents a turning point in our approach to the political and economic life of the ancient world. It should attract readers far beyond the field of classics, particularly political scientists, who will find in this volume a mine of new data and analyses to conceptualize the formation of federal states." "This is an excellent and very important study. Mackil is one of the most thorough, brilliant and accomplished Greek historians of her generation, and the book will be a ground-breaker." Below you may download full-color, high-quality versions of the maps included in this volume. All images © Emily Mackil. Map 1. Mainland Greece and the Peloponnese in the classical and Hellenistic periods. Map 2. Boiotia in the classical and Hellenistic periods. Maps 3a and 3b. Achaia in the classical and Hellenistic periods. Map 4. Aitolia in the classical and Hellenistic periods. Map 5. Aitolian population groups in the classical period. Map 6. Resource complementarity in preindustrial modern eastern Aitolia, circa 1821–1940. Map 7. Market networks of preindustrial modern Aitolia, circa 1821–1940. Map 8. The Boiotian districts circa 395 B.C.E. Map 9. The Boiotian districts circa 287–171 B.C.E.